In 2007, a group of theatre professionals in the Bay Area, me among them, decided it was time to get some rigorous, honest discussion going about the local performing arts scene beyond the dwindling pages of the local media. We did this because as in many arts communities, arts people around here tend to avoid genuine in-depth, critical conversation about the work being made on our stages. We wanted to break down conventional barriers separating artists, technical staff, managerial personnel and critics in an effort to confront both the good and bad elements we perceived on the Bay Area arts scene and its relationship to performing arts work elsewhere. So we started a periodic gathering of theatre professionals and others immersed in theatre (even if they make their living another way) to talk about all manner of theatre-related topics. Our Theatre Salons meet several times a year, these days at Z Space in the Mission. Our team of six organizers sets the topic, creates and sends out a manifesto-like program/invitation outlining the salon theme and logistical details and provides the snacks and ambience. Our guests, which vary in number from 25 - 60, bring wine and enthusiasm. Last night's gathering was a little different to the usual thing, and I have to say it was better. While up until now, we've generally tackled a range of big, abstract topics like "violence on stage," "the role of the audience" and "criticism," last night for the first time we discussed an actual play. 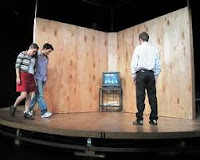 We indicated in the invitation that part of the requisite for attending the Theatre Salon was to go ahead of time to Yerba Buena Center for the Arts to see Mariano Pensotti's El Pasado es un Animal Grotesco (production image pictured above). John Wilkins, a local theatre director and teacher, and one of the core organizers, picked the production on the basis of its positive reviews. It also made a compelling choice, quite frankly, because it was a foreign production on tour from Argentina. This fact meant that attendees could be openly critical about it without risking offending anyone in the room. Homing in on a specific production rather than talking about an amorphous theme made for a much more focused, opinionated and diverse discussion. Though most people, myself included, got a lot out of Pensotti's literary and physically arresting drama depicting 10 years in the lives of a bunch of 20 and 30-somethings, there were several strong cases made against the production. I was swept away by the bold use of metaphor and the uncanny mixture of 19th century novelistic naturalism and 20th century magical realism. But others found the endlessly trundling round stage and half-told stories to be frustrating and boring. But what was even more exciting about the quality of our discussion was how it went far beyond the stuff of the play itself and into conversation about bigger ideas such as the nature of audience engagement and the role of criticism. We got much further and deeper yesterday with regards to these topics than we did in previous salons where audience engagement and criticism were the focal themes of the evening. What we'd like to gradually move towards in the future is a discussion about a show that's produced locally. It's one thing to have a critical and analytical discussion about a play which was created abroad and doesn't involve anyone we know. But can we attain the same level of engagement regarding a Bay Area show? That's going to be much trickier, I think. But it's a worthy goal to work towards.